For the first time ever, a Division I basketball team has won 100 games in a row as the No. 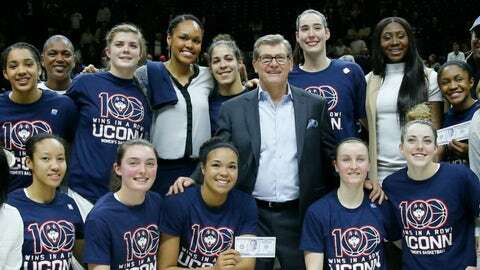 1 ranked UConn Huskies team topped No. 6 South Carolina, 66-55, in Storrs, Connecticut for their 100th straight win. On the surface, the win looks like just another night in the life of UConn’s women’s basketball, a seemingly never-ending streak of easy wins against overmatched foes. And because of that, Tuesday morning will likely be filled with the same criticism the Huskies always face. Some will wonder how good their competition is. 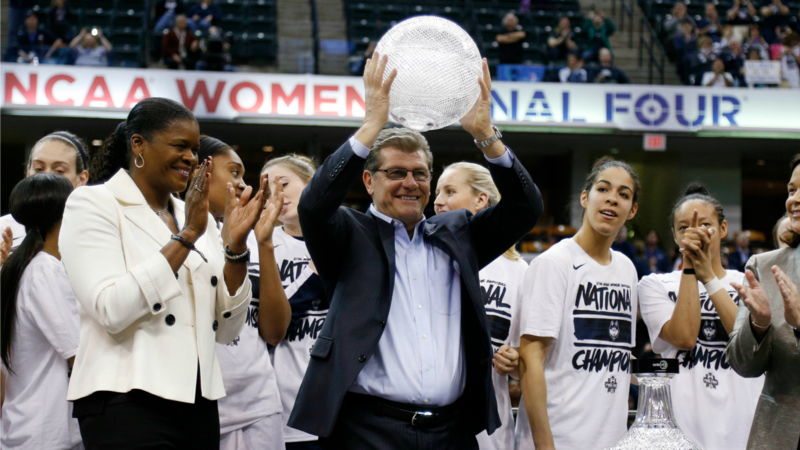 Some will say that a 100-game win streak speaks the inferiority of women’s basketball, rather than the greatness of UConn. Those people are wrong. The Huskies are accomplishing things that no one in the history of modern sport ever has. And rather than criticizing them and picking apart their every move, it’s time to appreciate everything UConn has accomplished. For starters, think about that number for a second: 100. For 100 straight nights, UConn has been the better team. It didn’t matter who the opponent was. It didn’t matter whether the Huskies were dealing with injuries (guard Kia Nurse was limited due to a bad ankle on Monday) or foul trouble or a team-wide case of the flu. It didn’t matter whether the game was at home, on the road or on a neutral court. The Huskies won ‘em all. Regardless of the sport or competition level, a 100-game win streak is incredible. What’s even more impressive is that the Huskies have done it in what amounted to every opponent’s biggest game of the season. It’s one thing to win. It’s another thing to do it 100 times, when you get the other team’s best shot each and every night. Still, folks will probably try to pick the Huskies apart. Many will question who they’ve played. But in the case of the Lady Huskies, the competition has been pretty darn good. Of the Huskies’ 100 wins, 27 of them have come against ranked opponents and this year the road has been especially grueling. The Huskies have faced nine teams currently ranked in the AP Top 25, including a staggering six ranked in the top 10 overall. They’ve beaten them all, with wins over No. 2 Maryland on the road (the Terrapins’ only loss) and against Florida State and Baylor, which both tied at No. 4 in the rankings this week. Keep in mind that UConn has gone through this gauntlet of a schedule after losing three starters off last year’s team, including three-time National Player of the year Breanna Stewart. And really, that’s what is most impressive about this streak. 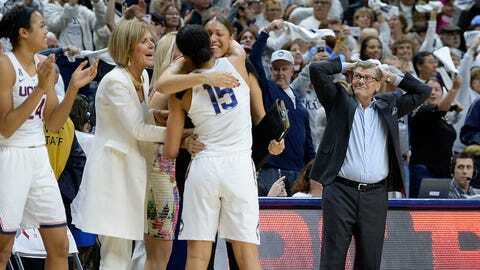 For UConn, the players change and the opponents change, but the expectation to win every game stays the same. Like the New England Patriots in the NFL or Alabama Crimson Tide in college football, the Huskies don’t just play individual opponents. They play to the standard they have for themselves — a perfect example of that was on display Monday night against South Carolina. If there was one team with the credentials to knock off the Huskies, it was Dawn Staley’s club. The Gamecocks entered the night ranked No. 6 in the country, with a 21-2 overall record. They had also actually played UConn tough during this streak; when the two clubs got together last year, the Huskies “only” won by 12 in Columbia. On Monday night, South Carolina was confident early and actually led with just under a minute before halftime. After UConn went ahead, the Gamecocks cut it to 39-35 with five minutes left in the third quarter. For a moment, it felt like South Carolina could pull the upset. But then the Huskies did what they always do. They forced a few turnovers, got to a few more loose balls, made a few more plays, and all of a sudden, a four-point lead turned into 13 with just over four minutes to go. At that point, Staley actually had to pull a few of her starters; not because the game was over. But because they were visibly shaken. Honestly, who could blame them? In a top-10 matchup with a chance to end a 99-game win streak on the line, the Gamecocks had poured their hearts out for 35 minutes. They’d laid it all on the line. They’d given their absolute best. 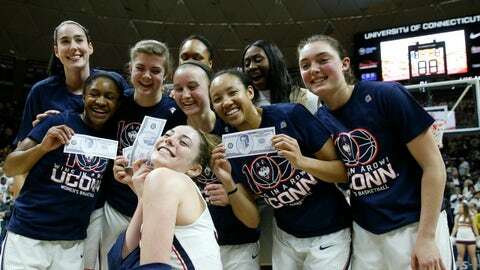 At this point, it’s time to stop questioning UConn and start appreciating what the Huskies are accomplishing. We’ve never seen anything like it. And we never will again.